Mautic enables users to be GDPR compliant. This article describes the necessary steps and set-up required to follow GDPR guidelines. Contacts that fall under GDPR requirements need to provide consent to having their personal data collected and used for communication. We recommend setting up a checkbox on your Mautic forms that allow contacts to opt-in. Follow the instructions below on how to set up an opt-in checkbox. By default, the checkbox will be unselected, so the contact has to select it and submit the form in order to opt-in. If this is a new form, you’ll want to add this to your Mautic landing page or website. We also recommend updating all existing forms with this new checkbox, so you can stay compliant. Note, the names of the fields can be changed and customized based on your business. To build a form, follow the instructions on our Forms training document. The benefit of adding the contacts into a “GDPR” segment means they can be reviewed or even communicated with at a later time. To provide the data to the contact, please follow the steps below. Contacts have the right to request their data to be deleted. Mautic allows users to delete contact records in two ways: 1) Manually and 2) Automatically. To delete a particular contact record from Mautic as well as the database, please follow the steps below. 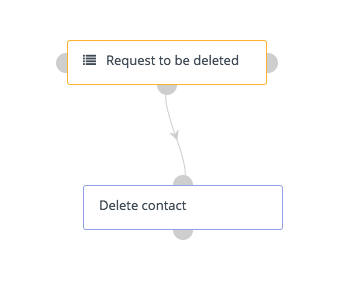 This campaign will automatically detect contacts who have requested deletion of their data (since they’ve been added to the “Request to be deleted” segment) and then delete them in bulk. This is a recommended set-up for Mautic users who have over 5,000 contacts. Please note that all names of custom fields and form fields provided in this document are just suggestions by Mautic. As a business, you have the right to create other related names for your fields. For additional support or if you have any questions, please contact your Customer Success Manager or email support@mautic.com.